Lacrosse is a Native American game that was played on a pitch field over a mile wide and sometimes lasted for days. Early lacrosse balls were made from deerskin, clay, stone, and sometimes wood. The game had a significant role in the community and religious life of tribes across the continent for many years. 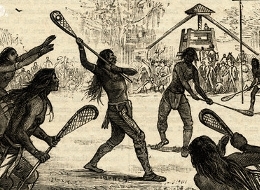 Early lacrosse was characterized by deep spiritual involvement, befitting the spirit of combat in which it was undertaken. Those who took part did so in the role of warriors, with the goal of bringing glory and honor to themselves and their tribes.The game was said to be played "for the Creator." Its name was dehuntshigwa'es in Onondaga ("men hit a rounded object"), da-nah-wah'uwsdi in Eastern Cherokee ("little war"), Tewaarathon in Mohawk language ("little brother of war"), and baaga`adowe in Ojibwe ("knocking about of balls").